Home Sweet Home ~ The Bucky Channel - The World of Sports from Wisconsin's Perspective. Milwaukee needed to win both home games to get back in their playoff series against the Atlanta Hawks, and that is what they did. The problem in the first two games in Atlanta was they got away from team basketball. Good thing they have a coach like Skiles to make them realize that they need to pass more to create better shots. The series has been all about who wins the first quarter. Well nothing different Monday night as Carlos Delfino put the first quarter in his hands. He scored 13 points, and had a nice dish to Gadzuric for an and one with 44 seconds left. That really got the Bradley Center rocking early. The second quarter was back and forth, but the Bucks were able to take a four point lead into halftime. The third quarter is when things got good again for the Bucks. Seven different Bucks scored in the quarter as Milwaukee outscored Atlanta 31-24. Seven people scoring in the quarter means one thing and one thing only and that is teamwork. Luc Richard Mbah a Moute is the best at cutting to the hole on this team. In the third he played his best basketball of this series, scoring seven of his ten points. Another guy who played his best game of the season is Dan Gadzuric, who made a huge layup at the buzzer to give the Bucks a 85-74 lead after three quarters. Twelve minutes away from possibly winning game four I was a little nervous, but my boy Jerry Stackhouse from UNC made a nice jumper to start the quarter. Its nice to have a veteran like Stackhouse make a big shot and take some of the pressure off the other guys. The first hoop of the final quarter is always the hardest. The Bucks did run into a road block in the fourth quarter after Gadzuric made a jumper the Bucks went cold for four minutes. Good thing the Hawks didn't catch fire during the Bucks cold streak. The Bucks made 11-12 from the free throw line in the final 1:28 to seal the deal. Lets check out some highlights from this huge 111-104 Bucks Win! 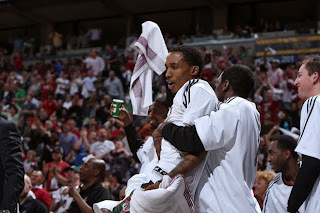 * Brandon Jennings looked like a seven year pro on the court Monday. This might really be the start of something special with this kid. After the game he talked about how he is still not satisfied with how they played. He isn't giving in to winning a few games at home, he knows they need to go on the road and steal a game form the Hawks. For the game Jennings finished with 23 points, 6 assists, and 4 rebounds. * John Salmons and Carlos Delfino also played huge roles for the Bucks. They finished with a combined 44 points, with each of them scoring 22, 6 assists, and 5 rebounds. These are two guys that need to pick up some scoring with Bogut out, and they did just that Monday. * Talk about the team effort as five players scored in double figures for the Bucks. As for the Hawks they only had four who scored in double figures. For a team like Milwaukee having everyone pitch in is key if they want to get victories like they did Monday night. * Jerry Stackhouse told Josh Smith a very good Restaurant to go to in Milwaukee. Smith went and said he would give it a 5 out of 5, which are kind words for someone who said there is nothing to do in Brew City. After eating a supposedly great meal Smith went out and did work on the Bucks. He kept the Hawks in it as much as he could, but he did have some mental problems that may have cost him. It seemed the Bucks fans got into his head a few times with their constant booing every time he had the ball and that threw his game off a little bit. * The Bucks were plus ten on made free throws. If you have watched this team all season you know that they don't get the line much, but Monday they went to the hoop strong. Also the Hawks only had two blocks for the game. Blocks are what killed the Bucks in the first two games of this series. And now we move on to the biggest game of this series, which will be Wednesday in Atlanta at 7:00 central time. This series is going to start fresh for both teams. It will now be a best of three series, with the Hawks getting two home games if you needed a reminder. I know all these stats out there about how the Hawks are just awful on the road in the playoffs, but this Bucks team was very off game one and game two was close. Milwaukee should be able to go Atlanta and put up a good fight. If the Bucks could pull out this game Wednesday I really see this team moving on. Like Jennings said on his Facebook status (go ahead make fun of me for a Facebook reference) "We're not a good playoff team till we win a game on the road." What can I say he has a great point, lets home they are a good playoff team come this time Wednesday night. I agree that this was more than just a win against a bad road team. The Hawks didn't play "bad" last night. Bibby, Crawford and Johnson shot very well, even for them. The Hawks perimeter D was no good but that's not a function of playing on the road -- the Hawks perimeter defenders are awful all the time. One point that also occurs to me is that the confidence thing applies to Crawford, too. He looked lost in the first three games, the first playoff games of his career -- just as Jennings looked lost in game 2. Young Buck, however, is only going to get more aggressive going forward. Fear the Deer!! !